Hi all! Cynthia D’Alba here. Mega-thanks to gal-pal Delilah Devlin for having me here today. 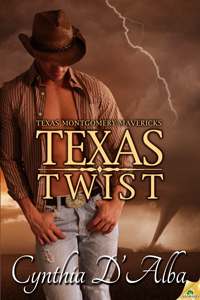 I’m happy-dancing over the release of TEXAS TWIST, the fourth book in the Texas Montgomery Mavericks series. Real bad boys can grow up to be real good men. Hit hard by the death of her parents, Paige Ryan needs to figure out what to do with her life. She moves to Whispering Springs, Texas, to be near her step-brother. But just as she starts to get her life on track, the last man she ever wanted to see again sends it right back off the rails. Cash Montgomery was on the cusp of having it all. Three bull riding titles, fame, fortune and respect from his family. Until a bad bull leaves him injured, angry and searching for comfort at the bottom of a bottle. With nowhere to go, he moves into his sister-in-law’s old ranch house in Whispering Springs—which he’s surprised to find already occupied. As Cash rebuilds the dilapidated home and Paige starts out on her medical career, their old friendship begins to reemerge and sparks are ignited. Paige knows that Cash is nothing but a heartache waiting to happen. But maybe this bad boy has grown up to be a real good man? Warning: Watch out for falling lumber, falling in holes, and falling for the wrong guy…again. You can leave your hard hat on. And don’t forget…I’m trying to give away some cool prizes! AND, if you read Texas Twist and leave a review (Amazon, Samhain, Goodreads, Barnes & Noble…basically anywhere! ), there is a contest JUST for reviewers. 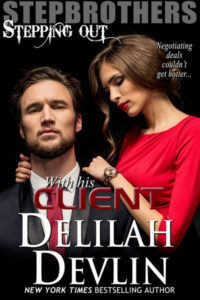 You can enter the reviewers only contest at Rafflecopter or at Facebook. Thanks for coming by! 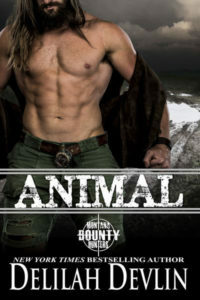 Are you a contemporary western romance reader?